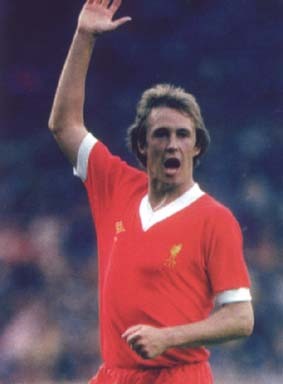 Contract expiry: December 1985, transferred to Bolton Wanderers how player-manager. Bob Paisley plucked Neal from Fourth Division obscurity at Northampton and transformed him into a player who would captain Liverpool, make 650 appearances, collect a joint-record eight Championship medals amongst a batch of honours and win 50 England caps. He was Paisley's first signing, costing just 66,000 pounds in October 1974, and was plunged into his top flight debut against Everton at Goodison a month later. Neal grasped his surprise opportunity to launch a glittering career essentially as a right back but with the capability of playing anywhere across the back line. His tally of 60 goals was amassed largely through his expertise from the penalty spot, although one from open play proved to be a golden strike. 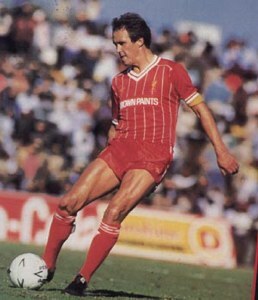 His goal against Roma in the 1984 European Cup Final ensured Liverpool went into a victorious penalty shoot-out against the Italians on their own ground. Seven years earlier at the same stadium he had dispatched the penalty against Borussia Moenchengladbach, which clinched Liverpool's first European Cup triumph with a 3-1 win. He became Bolton player boss in 1985 and later managed Coventry. 24/03/76 v Wales (A) W 2-1 (F), 28/05/76 v Italy (N) W 3-2 (MT), 31/05/77 v Wales (H) L 1-0 (HC), 04/06/77 v Scotland (H) L 2-1 (HC), 08/06/77 v Brazil (A) D 0-0 (F), 12/06/77 v Argentina (A) D 1-1 (F), 15/06/77 v Uruguay (A) D 0-0 (F), 07/09/77 v Switzerland (H) D 0-0 (F), 16/11/77 v Italy (H) W 2-0 (WCQ), 22/02/78 v W.Germany (A) L 2-1 (F), 16/05/78 v N.Ireland (H) W 1-0 (HC) 1 goal, 20/05/78 v Scotland (A) W 1-0 (HC), 24/05/78 v Hungary (H) W 4-1 (F) 1 goal, 20/09/78 v Denmark (A) W 4-3 (ECQ) 1 goal, 25/10/78 v Rep.Ireland (A) D 1-1 (ECQ), 07/02/79 v N.Ireland (H) W 4-0 (ECQ), 19/05/79 v N.Ireland (A) W 2-0 (HC), 26/05/79 v Scotland (H) W 3-1 (HC), 06/06/79 v Bulgaria (A) W 3-0 (ECQ), 13/06/79 v Austria (A) L 4-3 (F), 12/09/79 v Denmark (H) W 1-0 (ECQ), 17/10/79 v N.Ireland (A) W 5-1 (ECQ), 26/03/80 v Spain (A) W 2-0 (F), 13/05/80 v Argentina (H) W 3-1 (F), 17/05/80 v Wales (A) L 4-1 (HC), 12/06/80 v Belgium (N) D 1-1 (EC), 15/06/80 v Italy (N) L 1-0 (EC), 15/10/80 v Romania (A) L 2-1 (WCQ), 19/11/80 v Switzerland (H) W 2-1 (WCQ), 25/03/81 v, Spain (H) L 2-1 (F), 12/05/81 v Brazil (H) L 1-0 (F), 06/06/81 v Hungary (A) W 3-1 (WCQ), 09/09/81 v Norway (A) L 2-1 (WCQ), 18/11/81 v Hungary (H) W 1-0 (WCQ), 27/04/82 v Wales (A) W 1-0 (HC), 25/05/82 v Netherlands (H) W 2-0 (F), 02/06/82 v Iceland (A) D 1-1 (F), 16/06/82 v France (N) W 3-1 (W.Cup) sub, 25/06/82 v Kuwait (N) W 1-0 (W.Cup), 22/09/82 v Denmark (A) D 2-2 (ECQ), 17/11/82 v Greece (A) W 3-0 (ECQ), 15/12/82 v Luxembourg (H) W 9-0 (ECQ) 1 goal, 23/02/83 v Wales (H) W 2-1 (HC) 1 goal, 30/03/83 v Greece (H) D 0-0 (ECQ), 27/04/83 v Hungary (H) W 2-0 (ECQ), 28/05/83 v N.Ireland (A) D 0-0 (HC), 01/06/83 v Scotland (H) W 2-0 (HC), 15/06/83 v Australia (A) W 1-0 (F), 19/06/83 v Australia (A) D 1-1 (F), 21/09/83 v Denmark (H) L 1-0 (ECQ) (50).